I managed to spend a little time in Chelsea on Saturday. Between it officially being summer now, the on-and-off rain that afternoon, and the recent art world binge in Basel, the neighborhood was the most quiet I have ever seen it on a weekend. I'm betting that it's only a matter of time until Charlie Finch starts to slobber all over work by Mayumi Lake (at right). Her show, My Idol, which closed Saturday at M.Y. Art Prospects featured several photographs of an attractive, unclothed young Asian woman and an inflatable doll whiling away an afternoon in a love hotel. Justin Lowe's installation, Helter Swelter, at Oliver Kamm 5BE takes the prize for least likely gallery installation of the summer. It's also one of the most fun. Overheard in an otherwise empty gallery (they all were on Saturday): an artist dropping off work and a gallerist discussing how the materials should be described on the price list. The dilemma centered on whether to mention specifically that the piece contained Shrinky Dinks or whether they should go with the more generic, but somewhat more dignified "mixed media." I weighed in with a preference for touting the Shrinky Dinks. They lend a retro, kitch vibe to the work, and that vibe is certainly selling these days. I've said it before, but I'll say it again. For my money no one does exhibition brochures, guides, and websites better than the Pulitzer Foundation. What makes a day in the life of an empty gallery so engaging? It's the light. 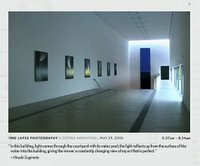 The video shows something that visitors to the space don't typically notice in the course of an hour spent there. The light moving through Tadao Ando's space brings out different characteristics in the art over the course of the day. Notice, especially, the change in character of the permanently installed Ellsworth Kelly piece behind the stairwell. Seen recently: a small slip of yellow paper, of the kind used for credit card receipts, lying on the floor in the middle of a gallery. The paper's edges curled gently toward the ceiling as it rocked back and forth in response to air currents passing through the room. On the walls were a Richard Tuttle dyed canvas and a wire drawing. Question: how many Tuttles in that room, two or three? Do We Really Need Video Tours? I spent the week in St. Louis. This evening I managed to find an extra hour in the schedule before my flight home, so on the way to the airport I made a quick stop at the St. Louis Art Museum. I didn't have any plans for the visit, but when I arrived I managed to sweet talk my way into a preview of SLAM's new installation of the Whitney's traveling exhibition, Remote Viewing (Invented Worlds in Recent Painting and Drawing). The show opens to the public tomorrow. I am always an advocate for innovative educational and outreach offerings, but I can't help but question whether it's really such a good idea to encourage people to wander through galleries looking at a tiny video screen. I noticed as many eyes focused on the iPods as I did on the art that the iPods were supposed to be illuminating. 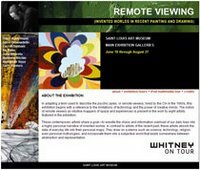 Update: I totally missed the delicious irony here: video tours for an exhibition called Remote Viewing. I'm glad someone's more on the ball than I am. Anyway, on Sunday I said that I may have some interesting things to say this week. Maybe I still do, but I don't know that they'll show up here after all. I'm a wee bit overextended right now and don't seem to have the excess mental energy needed to finish a few of the things I want to write. I've been focusing on other things lately, and they're starting to pay off. My Gold status in the American Airlines frequent flyer program came through this week, for instance. I've still got something I want to write up in depth about wall texts based on my recent visits to Tate Modern and the Barnes Foundation, but seeing as there are probably only three people in the world who care about that topic, I'm going to let it sit for a while. Thanks for checking in. I'll be back when I'm back. See you then. I'm still here, but it's been a long, hectic few weeks. I'm actually back state-side this week and may have a little something to say here for the first time in eons.